The Krewe of Pontchartrain is a long-standing New Orleans Mardi Gras organization that parades down some of New Orleans’ most famous streets. 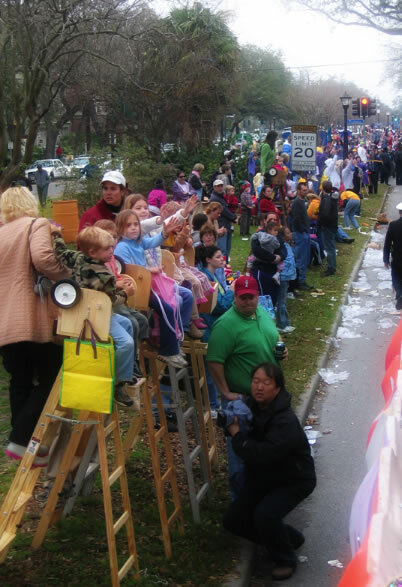 Our parade starts at 1:00 pm on the first Saturday of the official New Orleans Mardi Gras season. Some years the Krewe invites a celebrity to be the “Grand Marshal”. Each Grand Marshal has their own specially designed cup just for the parade. Past Grand Marshals have included singer and musician Allan Toussaint, actor Red Buttons, baseball star (New Orleans’ own) Will Clark, TV Star Bart Simpson, singer Irma Thomas, Sports Commentator Jim Henderson, and last but not least, entertainer extraordinaire Becky Allen. Sound like fun? It is. Sign up to ride with us! Spectators begin to line the parade route. The parade route is approximately 5 miles long and takes about 3.5 hours to complete. Besides the wide array of bands, horse units, dune buggies, motorcycles, and jesters, our parade has featured some of Mardi Gras’ most memorable floats, such as “Mr. Mudbug” (the world’s largest crawfish) and a giant fish dubbed “The Super Grouper”. 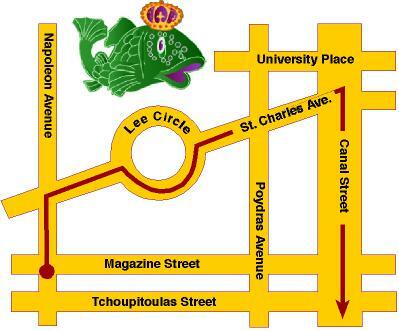 The parade’s starting point or “line up” is at the corner of Tchoupitoulas Street and Napoleon Avenue (right in front of Tipitina’s Uptown – the location of our pre-parade breakfast). The parade rolls down Napoleon Avenue to historic St. Charles Avenue and then to Gallier Hall for the official toast. From there the parade turns onto world-famous Canal Street and then up Tchoupitoulas Street to Poydras Street, where the parade ends.